Damson Jam, thought by many to be one of the finest jams, is an easy one to make if a little fiddly at times during its' preparation. Damsons are a small variety of plum, dark blue in colour with a bloom and slightly pointed at one end, which ripens in late August-September. 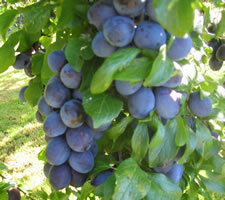 It is easy to grow, the most well known variety being Farleigh Damson. The trees can be purchased from outlets that keep more than the common garden centre varieties. Try Perryhill Nurseries of Hartfield or Keepers Nursery of West Farleigh if you want your own tree! When you've picked the damsons, put them in a bowl and cover with cold water to wash them. De-stalk any which still have stalks and discard any shrivelled or damaged fruits. I run a knife around each fruit to slit the skin and allow the exit more readily of the stone during cooking. Put the measured fruit and water in the pan and simmer gently for about 30 minutes. A little more water may be added if needed, to stop the fruit from burning. Stir in the sugar which will disolve easily. Boil the jam as quickly as possible without it frothing over. You will find the stones rise to the surface of the bubbling jam rising with the heat currents in the pan. Skim off the damson stones as they rise to the surface, partly with a slotted spoon and later with a wooden spoon when you get down to the last few stones. Test for setting point at intervals after 10 minutes fast boiling and then pot and cover in suitable sterilised jam jars.